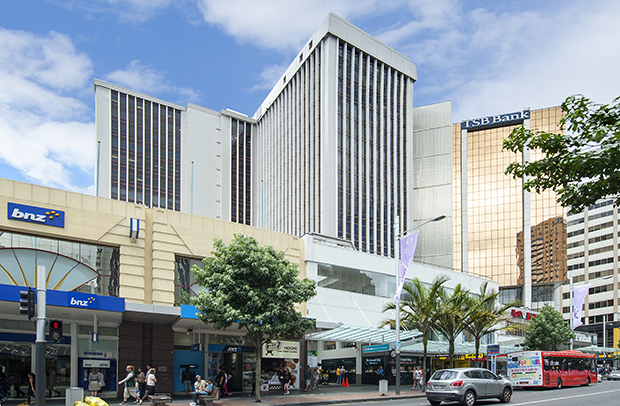 Auckland, 2 March 2013 - ​A prominent and seismically-strong commercial building with multiple long-term tenants on a healthy Weighted Average Lease Term in one of the busiest parts of Auckland’s CBD has come up for sale at 280 Queen Street. Marketed exclusively by Warren Hutt and Jonathan Ogg of CBRE, the 15-storey freehold property is for sale by deadline private treaty, closing at 4pm on 4 April 2013. “This property occupies a prime, busy and sought-after location with significant street frontages to Lorne and Queen Streets,” says Hutt. “Pedestrian foot traffic counts in this location are literally the highest in the Auckland CBD. Occupying a 2,253sqm site in the heart of Queen Street close to the Civic Theatre, 280 Queen Street has a net lettable area (NLA) of 14,764sqm, comprising 11,352sqm office, 3,412sqm retail and 44 car parking spaces, which are accessed from Lorne Street. Originally erected in the early 1970s, the property was extended through the construction of an adjoining office tower in 1992. This increased the floor area to its current 14,764sqm. The property also underwent a significant refurbishment in 2007 and more recently, close on $4.5 million has been spent on capital upgrades to the air conditioning, lifts, new security system, and the refurbishment of office floors, etc. Today, the building offers three levels of very good retail accommodation, 12 levels of commercial office premises and secure off-street parking for 44 cars. The retail tenancies are contained on the ground and first two levels, with level three being used exclusively for car parking. Above this, the upper levels provide office accommodation, with a residential apartment on the top floor. Hutt says that occupancy within the building sits at over 90%, with income from the 12 office floors providing just over half of the property’s total annual net income. Office tenants include The Department of Labour, The Ministry of Justice, The Controller & Auditor General, Millennium & Copthorne Hotels New Zealand and The Insurance Brokers Association of New Zealand Inc.
National and internationally-prominent retailers occupying space within the building include Vodafone, Esquires, New Zealand's largest home entertainment specialist, JB Hi-Fi, and OPSM, the leader in the optical retail market, which operates over 300 stores throughout Australia and New Zealand. Labtests also operates a collection centre in the building, providing a range of pathology services for GPs, public hospital clinics and midwives for diagnostic testing. Located in a prime position in the heart of the central city, the site commands a large frontage of approximately 26 metres to Queen Street and approximately 46 metres to Lorne Street. Hutt says that the property benefits from some of the highest pedestrian foot traffic numbers in the Auckland CBD. “The Property Institute of New Zealand (PINZ)’s most recent pedestrian count survey in the Auckland CBD, in October 2012, revealed 643 pedestrians passing by in the morning and 1,298 in the afternoon. These findings strongly support the location as an established and popular retail precinct, unrivalled in terms of pedestrian amenity. Ogg says that the property’s zoning with the Strategic Management Area 1 (Core Strategic Management Area) in the operative Auckland City Council District Plan provides for a diverse range of office, retail and entertainment activities at the highest development intensity levels available within the CBD. “Strategic Management Area 1 contains New Zealand’s highest concentration of high rise buildings, and provides for the widest range of development opportunities available. The area recognises the prominence of pedestrian activity and promotes a wide range of commercial activities, with the District Plan depicting the area as being ‘A Place of Opportunities’. Queen Street has been significantly enhanced as the city centre’s premier street in recent years. A 2008 street furniture upgrade involved the widening and relaying of footpaths with basalt kerbstones and bluestone paving, as well as installing new street furniture, Nikau Palms and other landscaping to create a boulevard effect. Ogg says that economic recovery has been followed by recovering demand for central Auckland office space. “During the past year net absorption exceeded longer term averages and, with the passing of the supply cycle peak, has resulted in improving vacancy. “Looking forward, the Auckland CBD office supply pipeline remains low. In the past five years more than 170,000sqm of new office space was completed while the current supply pipeline comprises only one major building of 19,000sqm for ASB Bank to be completed this year. He adds that Auckland CBD prime retail high series rents increased by 1.5% to $3,300 per sqm in the six months to June 2012, while low series rents remained unchanged at $1,700 per sqm. Hutt says that the building will appeal to a range of interested parties. “This seismically-strong property, which has significant office and retail components occupied by a diverse range of government, national and internationally-recognised tenants, in this high traffic prime location, will attract considerable interest from a range of parties.